There is nothing quite like waking up on a Saturday knowing that you are going to go mattress hunting. At Ikea. That maddening enforced maze. Those cute little scenarios that you can never recreate. And those blasted tempting meatballs. Unlike many families, we do not enjoy shopping. I detest the lighting in most stores and the claustrophobic feeling in all but the most unaffordable of shops; Mr A, well he is a guy; and Miss R likes shopping well enough when given a wad of money and a cheerio-goodbye from her parental benefactors (slightly unfair, she actually doesn’t mind hanging with me). I know we are atypical in this respect. One only has to go to Tesco or up into town on a weekend and one can see two- and three-generations of family strolling together, carrier bags swinging in unison – little Johnny and Jessica with an ice cream, and Ma and Pa with takeaway lattes or some such. How I envy their calm mien. With us it is more like Mr A hovering on a double yellow line and Miss R and me dashing about like demented wasps trying to get whatever vital item it is that we lack. Stressed and sweating we then pile into the car, like thieves making a getaway. I used to adore shopping, both proper and window. I can’t quite put my finger on why I would now rather stick pins in my eyes than schlep uptown to spend money I don’t have on something I don’t need. Perhaps it’s the largely indifferent service, or the feeling one is being manipulated (Ikea, I am talking about you). Or that I don’t care for what passes for fashion these days. Despite loathing it more than I loathe watching Gran Prix (which is saying something) sometimes you just gotta do it. And today was the day. To be far it wasn’t too hideous. Mr A sat in the car listening to rugby while Miss R and I flopped on beds. Quite an odd experience rolling onto one’s side and looking straight into the eyes of a stranger doing the same thing two feet away. Anyway, Miss R found a mattress. But little did we realise until we read the fine print that their mattresses are “European sizes”. Miss R’s bed frame is good ol’ John Lewis, some 10 cm shorter. Much sighing in silence on the way home. And we didn’t even get any meatballs for our troubles. As a way of saying sorry for not sussing out the measurement thing beforehand, I thought I would do us a proper lunch. Looking in the fridge and cupboards I knew I had ingredients enough to do a batch of my Triple Tomato Soup (I used tinned Cirio tomatoes instead of fresh – absolutely fine and dandy), as well as some day old bread to tear up and dunk into olive oil and little mounds of nutty dukkah. I also thought I would put together a grain salad that seemed to have gone down well with the lovely ladies at my Fife nutrition session the day before. They kindly wanted the recipe and as I hadn’t written it up I thought I would take this opportunity to do so and share it with you too. I have made it a number of times, always a bit different. When pomegranates are at their best I use them, and sometimes I use walnuts or pistachios instead of pecans. But always dried tart cranberries and always pomegranate molasses. I really love the sweet and tangy surprise they give the taste buds. 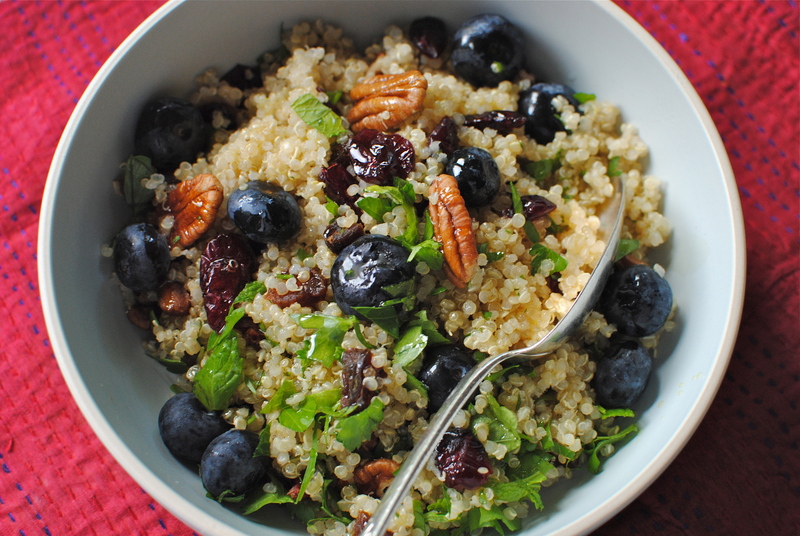 Grain dishes can be sweet (think fragrant apricot studded couscous) or tangy (think traditional lemony tabbouleh) but rarely are the two combined. I reckon it really works, but you be the judge. But another goodie in here is the blueberries. Long thought to be a bit of a damp squib nutritionally, scientists have found that this American native holds a lot of health promoting chemicals within in its dusky blue skin. 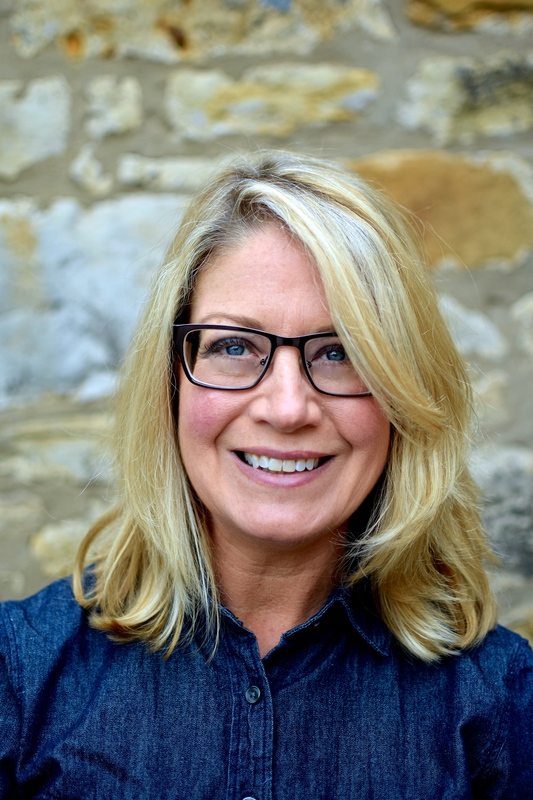 It isn’t over-endowed with the more obvious vitamins like A and C, but what it does contain – in abundance – is potentially much more useful to us. Without going all science geek on you (again) I should let you know that some of the most potent cancer-fighting substances are bound up in this bouncy berry’s royal blue colour. 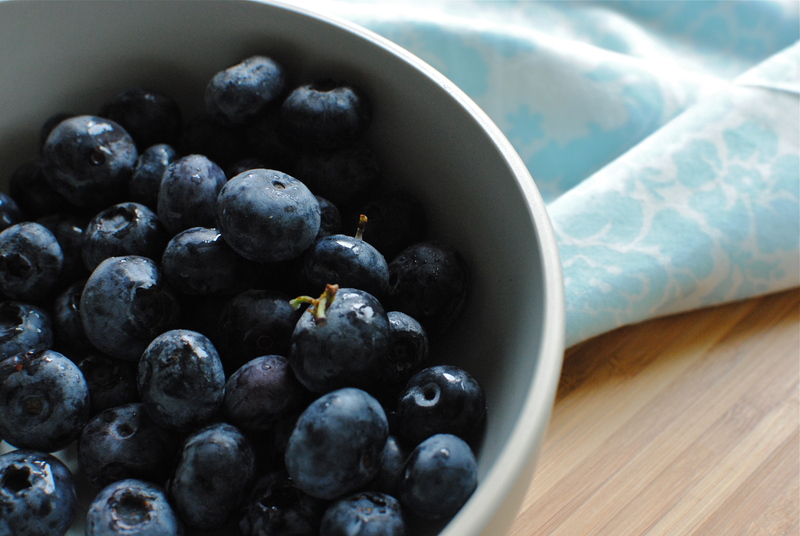 The high anthocyanidin and proanthocyanidin content is thought to be responsible for the exceptionally high antioxidant activity (and potential) found in blueberries, helping neutralise waste from our metabolic processes that can – along with toxic invaders such as ionising radiation, cigarette smoke and poor diet – cause permanent damage in the form of cancer and premature ageing. Antioxidants are not the be all and end all though, as studies have shown, but they are still incredibly useful when consumed in a varied and colourful diet. No supplements please. Perhaps more interesting and important in the long run is the potential for anthocyanidins and proanthocyanidins (try typing those quickly!) to curb the development and progression of cancer. ‘Anthos’ are known to stop DNA synthesis and therefore cell growth, in lab-grown cancer cells. This rapidly leads to cell death – apoptosis, to be technical. 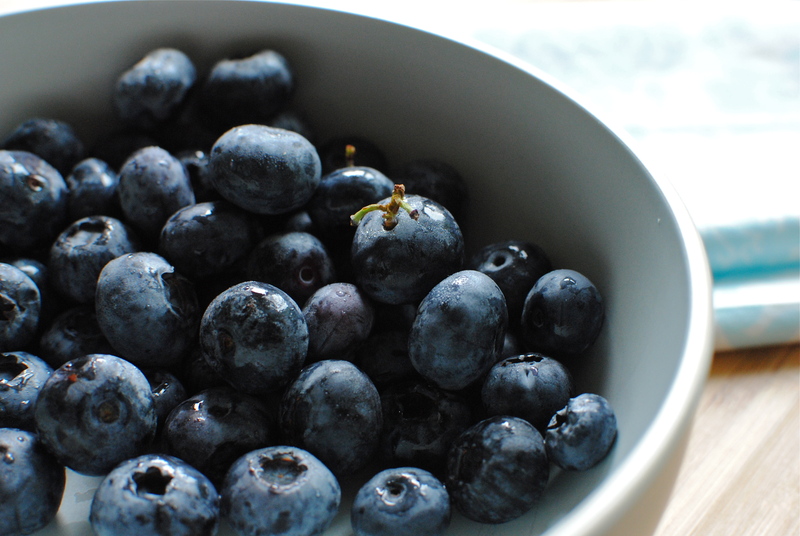 Other colourful fruits have this potential too, but because blueberries have as many as 30 different anthocyanidins – more than the typical four or five in other antho-containing fruits and veg – the potential for amazing cancer-nipping activity is greatly increased. Anthos are also highly anti-inflammatory and, along with tart cherries, can help relieve pain from rheumatoid arthritis. Before I lose you completely, just to say that proanthocyanidins have similarly cancer-zapping features. Again, only lab studies here, but proanthos have been shown to inhibit the growth of various types of cancer cell lines, with colon cancer being the most studied. Studies are close to unequivocally establishing that proanthos “disrupt the angiogenic development of new blood vessels and may therefore help keep microtumours in a latent state by preventing them from acquiring the blood vessel support network they need to grow” (from the book, Foods to Fight Cancer by R Beliveau and D Gingras). Other studies show that proanthos seem to “reduce oestrogen synthesis and can thus help counter the harmful effects of elevated levels of these hormones.” There are also some pretty fascinating studies on their positive effects on the brain regarding memory (including Alzheimer’s disease), coordination and balance. Most using amounts equivalent to a daily half-cup of blueberries. In other words, doable. 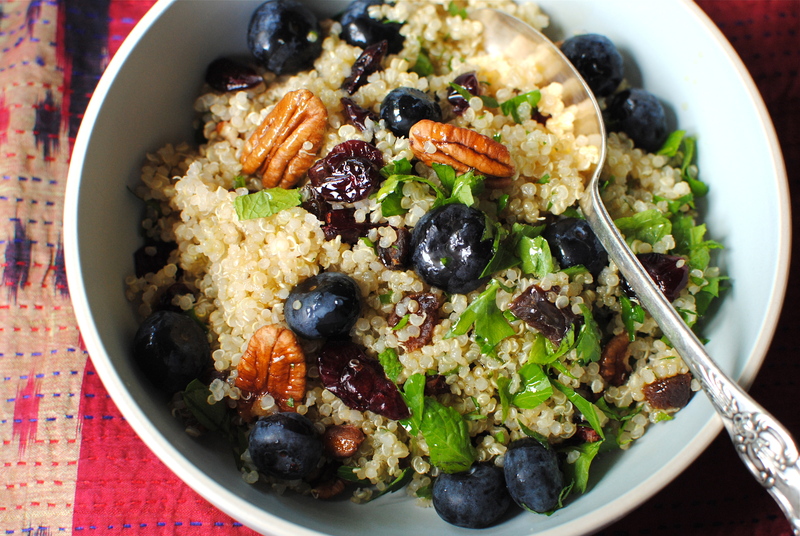 Other Ideas: Berries are so easy to add into the daily diet that it would be churlish not to. Chuck them onto cereal (maybe try them on Good-For-You Granola? ), whirl them up in a smoothie, toss them into a green salad, puree them and stir into yogurt or cream, add them into baking, grains (like here), juice them, compote them, have as they are for a satisfying sweet snack. They can even be married with red onion, chilli and herbs for a funky salsa to go with fish or chicken. Blueberries and most other berries are best fresh and raw, but you can still get goodness from a blob of homemade jam too. In Season: Looking at a site called Seasonal Berries I found that here in the UK we grow blueberries commercially from June to late August. Before and after that they come from Poland (not too far) and then Argentina (a bit too far for me). As a seasonal foodite I will be hunting out the final UK-grown punnets of these unique little berries before succumbing to Polish imports. Drawing the line at Argentina I will hoard local berries in my freezer and use them as fresh throughout the winter. US readers will know that you can get US-grown blueberries at any time, with Florida and California picking up any slack from the key-growing states of Maine and Michigan in the winter. If I still lived in Florida I would probably have a go at growing the interestingly-named rabbiteye, but as I would also probably still keep hens I could be sure that even if my brain and cells couldn’t benefit at least my girls would be fit as fiddles. delicious spice blends and pastes, too. the tiny grains, pour into a wide shallow bowl and fluff with a fork. cheese or even some griddled halloumi cheese. Wonderful pots, interesting with humour ~ just the way I like my reading! I knew blueberries were a super fruit ~ but please tell me, do our humble British bilberries/whortleberries have the same cancer fighting properties? I have always wondered, as I prefer the taste of bilberries (myrtles in France). A wonderful post, and snap, I loathe shopping now for most of the reasons you state……large shopping centres make me have anxiety attacks and I really only like shopping in small local shops. 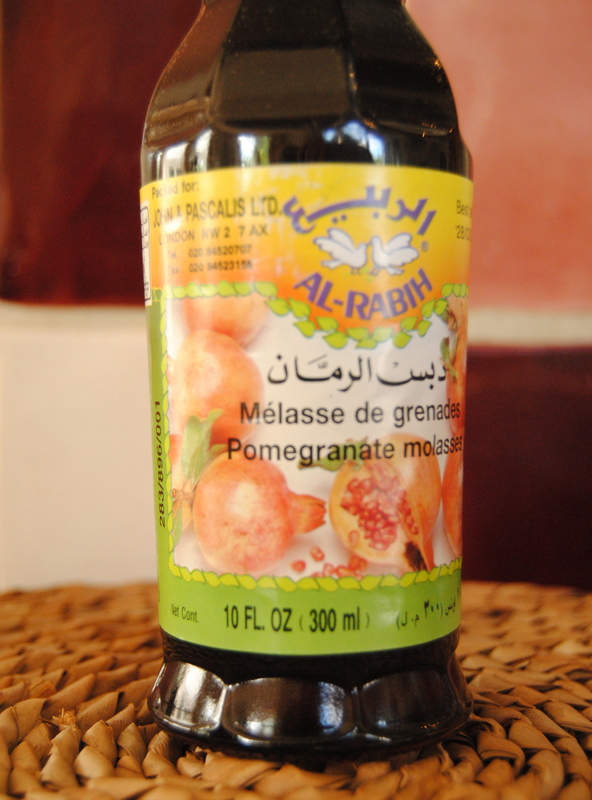 Forgot to say ~ I LOVE pomegranate molasses, used it when I ran a restaurant in Cyprus and your salad looks fabulous too! Aw thanks for the lovely comments! It is true that I have a well developed sense of sarky humour and appreciate it in others! PS: the restaurant was in “another! life, hard work but great at the time. Great, that’s Sam’s pack lunch sorted for tomorrow. Can you tell me if Sainsbury’s Blackhall sells the pomegranate molasses syrup? Thanks! Great thanks Samantha. I’m really happy as it’s an ingredient I’ve not used before and it looks right up my street. I’ll investigate the North Bridge shop but I’ve actually just bought a bottle in Blackhall as I was there anyway. Always Luke to hear of indi shops though. Now, I’ve just made this for the kids packed lunch and it is so delish that it’s in grave danger of being scoffed straight away. I am really enjoying my new found ingredient of the pom syrup – perhaps I didn’t need to buy the pom syrup though as I’ve actually got a bottle of grenadine in the cupboard (I always have grenadine in the cupboard because I love the bottle design & colour so much) but its nice as I said to be introduced to a new ingredient. You’re not the only ones who hate shopping. Like you I’d rather do almost anything than wander round shops. Especially IKEA. The place is a nightmare. Also like you we had an IKEA mattress experience recently, in our case the other way round. We got an ordinary mattress for an IKEA bed, and the mattress is too short! Thanks for another lovely looking recipe. I think there are lots of similar mattress experiences. I hope you were able to take it back 😀 Let me know if you make the recipe. It is one of my favourite autumn-winter salads, and my chickens go crazy for any leftovers! Well, its not ALL healthy as also in the lunch box is left over birthday cake (well two actually as Sam wanted to take a cake to work) – No.1 was choc & beetroot and No.2 spiced carrot cake – both wheat & dairy free versions. But yes, you are right with regard to your recipe posts, they normally induce me to make them straight away! Carpe diem and all that…. Hey, I need to work with you for gf versions of cakes and breads, don’t I? I’ve got all the gear but need your guidance re adjusting liquids. Guess I need to sneak over on one of your baking days for a bit of, ahem, ‘research’. Mmm, love spelt bread. Now that it’s getting colder I will be doing a bit more ‘comfort’ baking, like breads. 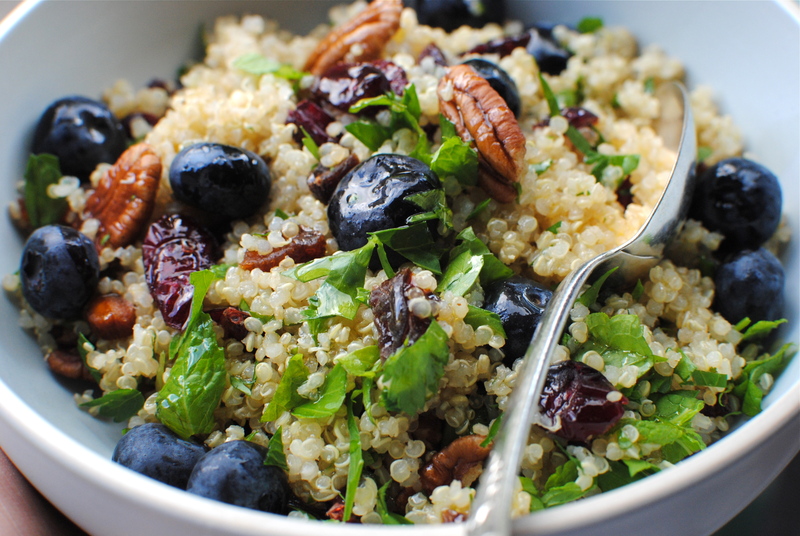 Hope the the sweet and tangy berry tabbouleh salad is enjoyed. I bet you wear a cute little retro/Amy Butler pinny for your domestic goddess duties. Wow, this looks so beautiful. 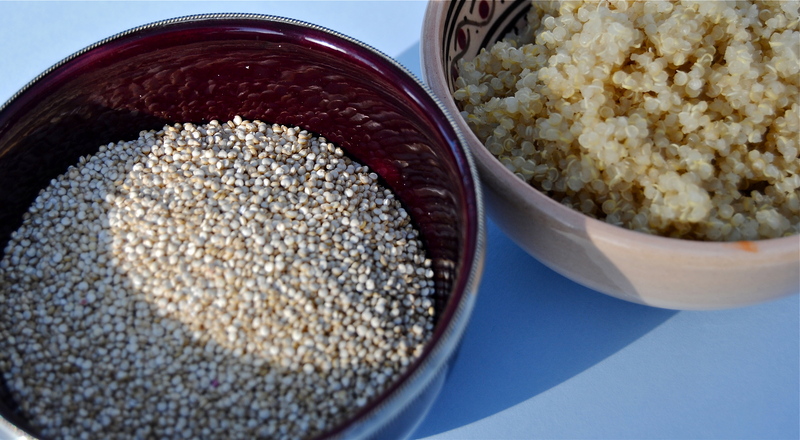 I love the idea of using quinoa for tabbouleh, instead of the usual bulguar wheat/couscous. Yum – I’ve bookmarked this too! Thanks again Angela 😀 I am a big quinoa fan; at work they think I am a bit of a quinoa cheerleader. Great nutrition, great taste (when prepared right) and a store cupboard essential for me. This recipe is a cinch to make and if you don’t add in the dressing until eating it will keep for a couple of days for lunchboxes, work etc.. You have a lovely blog and I’m so glad I saw you on Twitter.